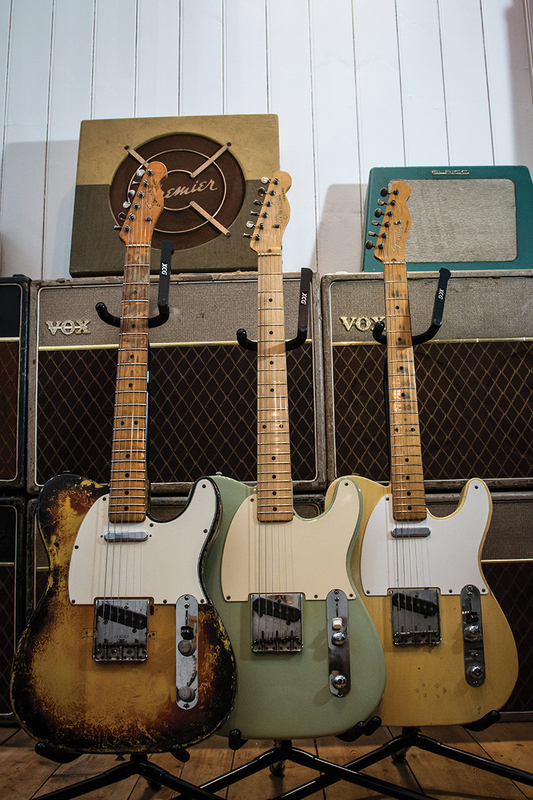 In nearly four decades of collecting, Richard Kingsman has amassed an enviable selection of classic guitars and one-off curiosities. Richard Kingsman started collecting guitars in the 80s while touring as a professional guitarist. Having owned several guitar shops since then, he was in many ways the original kid in a sweet shop. 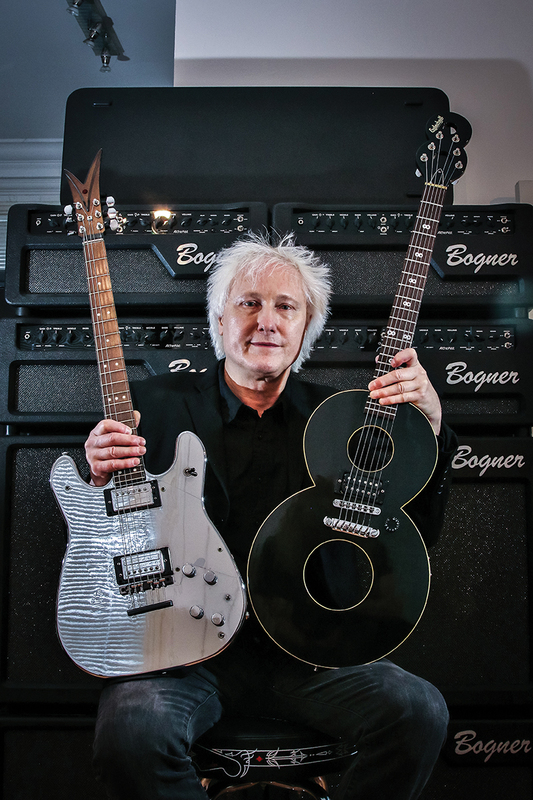 “After being in bands for as far back as I can remember and owning guitar shops for 25 years, I’ve lost count of how many guitars have passed through my hands”, says Richard. “I own The Music Trading Company in Rye, Sussex which can be a huge strain on my wallet, especially when a favourite that I may not have or a cleaner model comes in for part exchange. Although, there are signs that I’m slowly getting over the habit!” he laughs. “I also had the collecting bug in the 1980s. 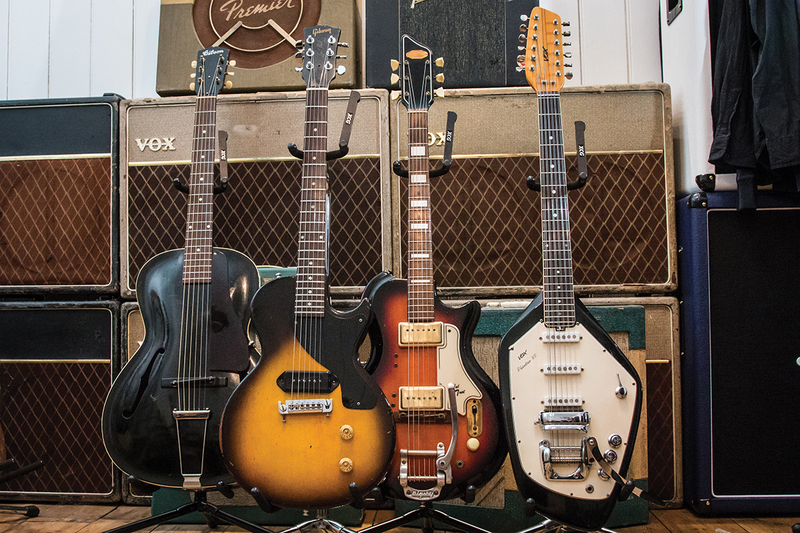 It was call the boom-years for amassing guitars, because you could afford to buy old guitars before it all went silly. It was an addiction that eventually grew into something much more substantial, however… “I was always looking to the future and after years of trading, I just decided to open my own shop,” Richard explains. “The first was in Ealing Broadway. As well as the classics, Richard’s V-love takes in some truly unique birds along the way. “I also have a Natural V2 with Boomerang pickups and a Gibson Moderne, which is number two of four prototypes built in 1980,” he enthuses. “I’m more of a rock player so I naturally lean toward a Flying V, Firebirds are also high on my list, but I’ve only upped the numbers to five in the last few years. “I have one Non Reverse Firebird at the moment from ’67 with three of the best sounding P-90s I’ve heard, I’m told they used old stock P-90s from the 50s, maybe that’s why. 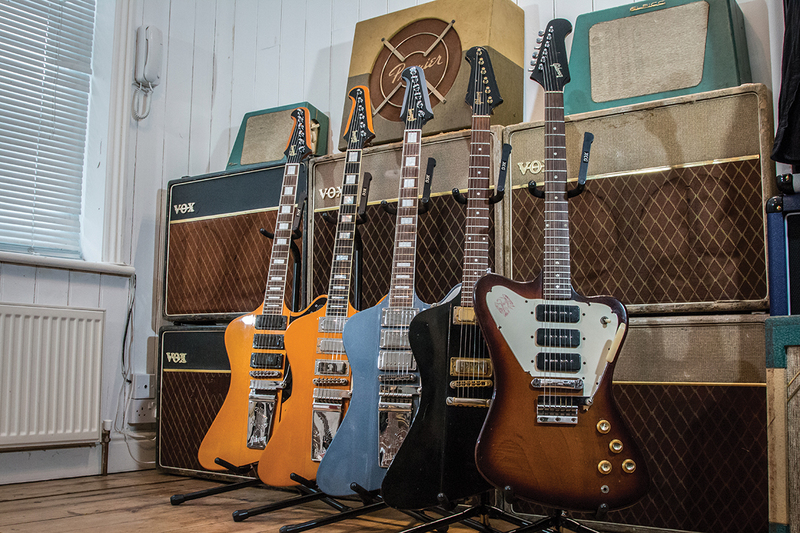 My favourite is my ’02 Firebird VII with a copper finish, followed by a Skunk Baxter signature model from 2012, also in copper, which has on-off and phase controls for the Classic ’57 mini-humbuckers. Indeed, as we go through his collection, Richard’s love of black is clearly in evidence. 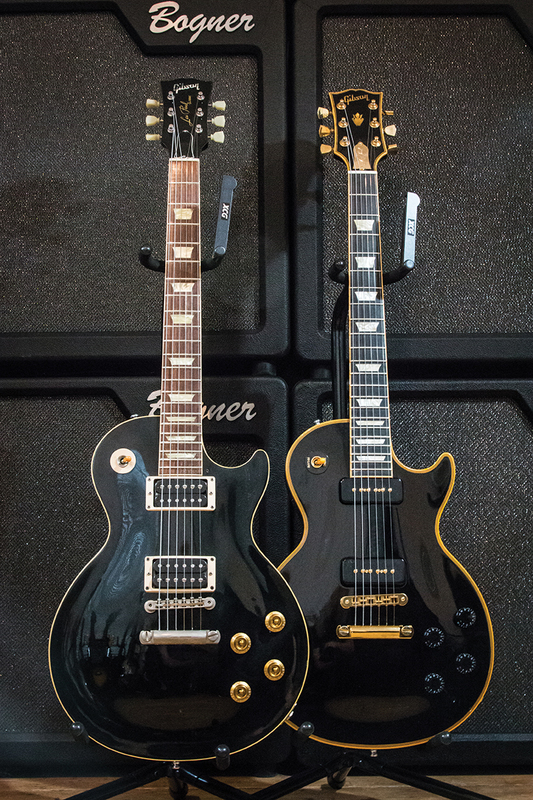 “Here are two more in black,” he says, pulling out two Les Pauls. “A Custom with amber binding and my ’94 Classic, which is my favourite of all my guitars – I’ve been gigging this for over 10 years. Apart from being black, it has all the attributes that I want in a guitar, like Kluson tuners, a distinct carved top, nickel hardware and hot ceramic pickups. As is the way with buying vintage curios, the dreaded ‘R’ word is a frequent companion – but it’s not something that phases Richard. 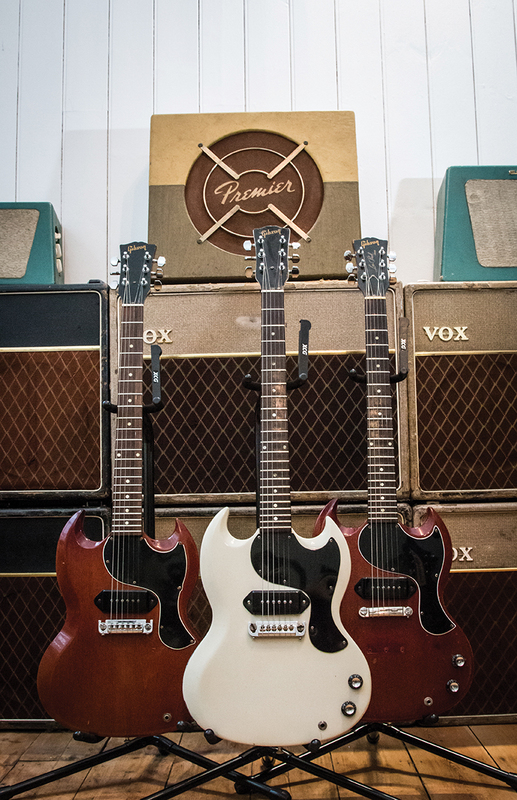 “Several of my guitars have required restoration work, or a project I’ve left half finished. My ’66 Tele is a fine example. It came in to one of my shops in Acton around 1999. It was covered in carved leather with rope binding. As I’m a vegan I had to get the leather off, but the adhesive had melted into the nitro and destroyed the original sunburst finish. I was going to go for a respray, but stood back and thought it had such an aged look about it, unlike the back, which is immaculate. It had been played so hard by the same guy for over 25 years, that he’d scalloped deep divots under the 2nd and 3rd strings, which I carefully filled and levelled off so it was at least playable. 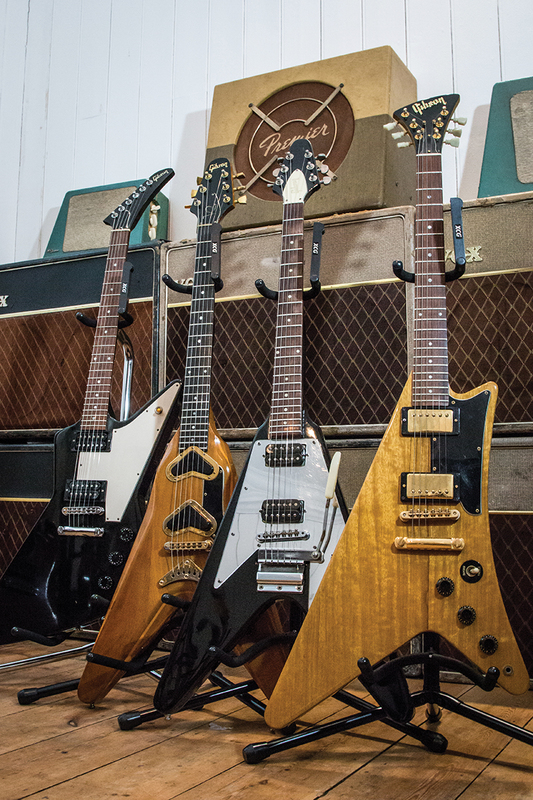 With so much knowledge and experience under his belt, it’s no surprise that Richard has formed his own opinions on guitars through the decades. 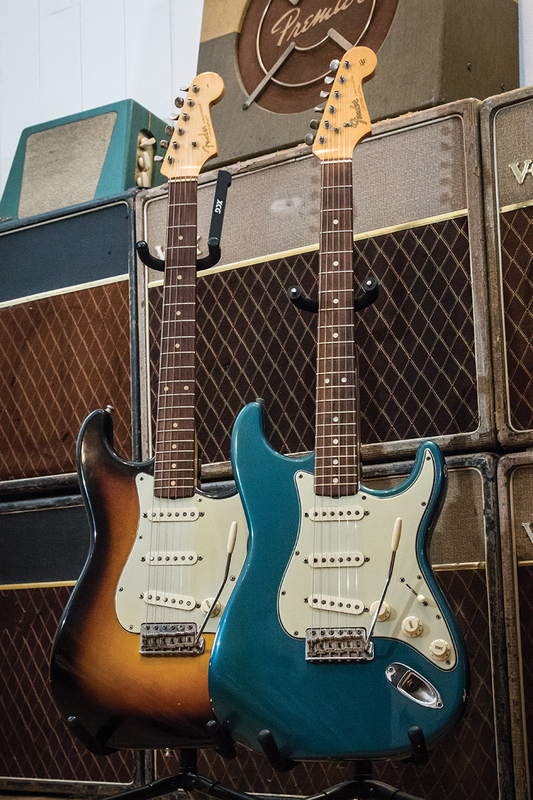 “I’ve come to the conclusion after handling so many early Strats, that the transition models from ’65, when Fender sold out to CBS, seemed to have that extra sparkle,” he insists. “The one in Lake Placid Blue is no exception, while my sunburst from ’60 with a slab fingerboard, still sounds stunning. It has a notably darker resonance. I actually bought the blue one, which has a scalloped nut, from a friend who bought it from Norman’s Rare Guitars shop in California. It would seem it didn’t have a tremolo arm, so the guy took one off a ’59 Strat. As a purist collector, I’m a little upset that there’s a ’59 out there somewhere with the wrong arm! Lake Placid Blue is such an iconic and pretty rare colour, I also have it on my 60s Fender Jaguar, although it’s a little worn around the edges. 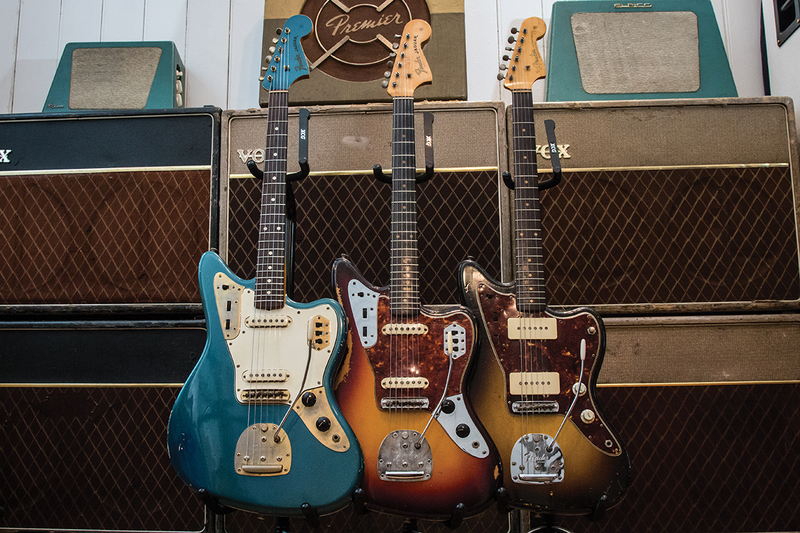 Ever the completist, Richard has always sort to build up full sets of guitars, even when they might not be to his taste… “To me, Jaguars and Jazzmasters are an acquired taste in both sound and playability,” he explains. “They’re not really my cup of tea, but when they were affordable I wanted one of each model. I felt the same way about Fender Broncos and Duo-Sonics as well, it was a case of whatever came my way. I bought a sunburst Musicmaster in the USA simply because I was there recording an album in a band called AS-IS. I just wanted to say I’d bought a guitar in America. I trawled through several magazines and this seemed the best deal. You don’t assemble such an enviable collection of classics by accident, and Richard always had a goal in mind, even if things have changed over the years. “My original plan had always been to collect iconic milestones within guitar history,” he confirms. “But I was also inspired by oddities like Veleno and American Showster – the latter being built by Rick Excellente in Maplewood, New Jersey around ’84. 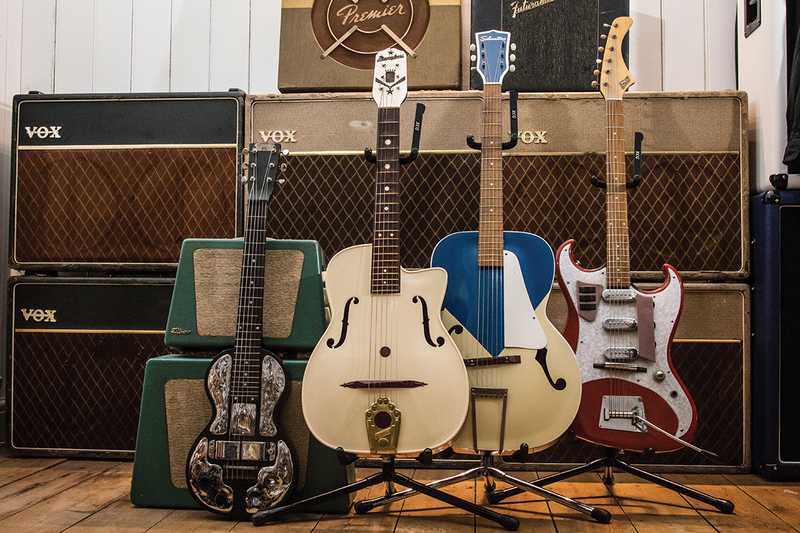 These exquisite guitars and basses were designed around the tail fin of a ’57 Chevrolet. This one is from the AS Series, is loaded with Floyd Rose pickups and the flagship flashing red tail light activated by the vibrato arm. 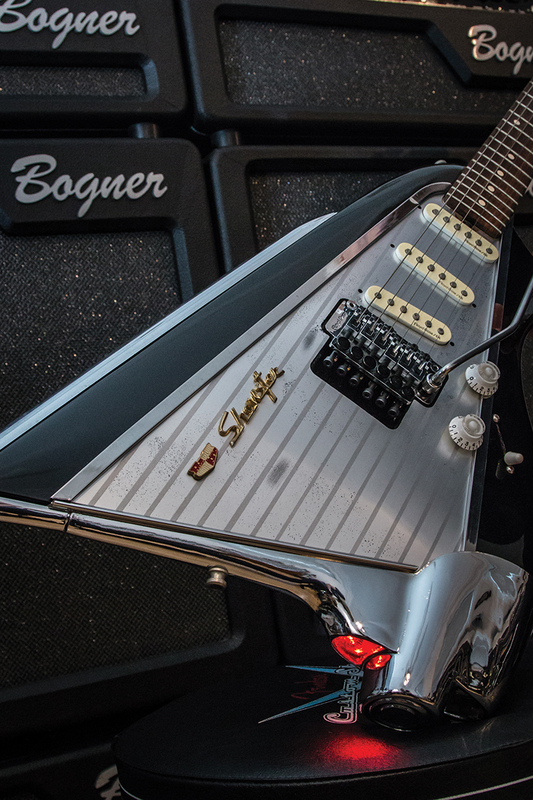 “The all-metal constructed Veleno guitars, were designed and built by John Veleno during the mid-80s. He was a master machinist and manufacturing engineer. The two body halves cut from aluminium are held together with Allen keys, they were available in chrome or gold with hardware and pickup options. My chrome version is loaded with a pair of Guild humbuckers. 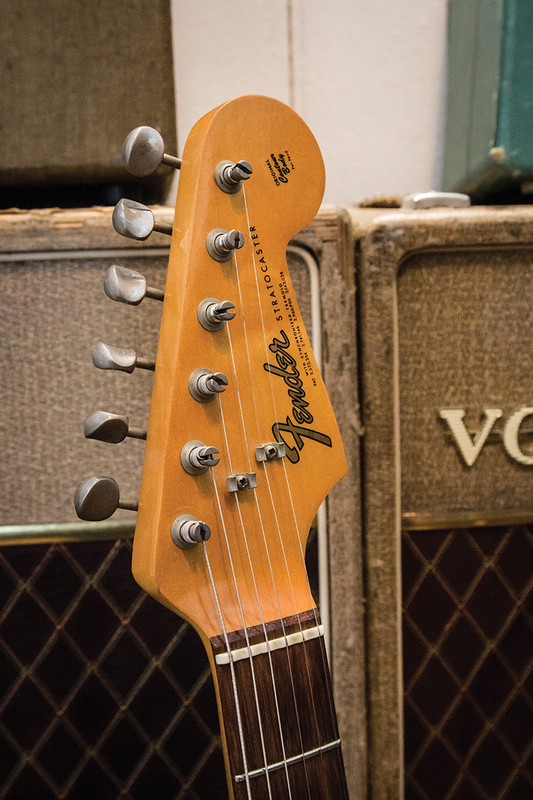 As it’s all metal, including the neck and fingerboard, tuning can be prone to temperature changes. 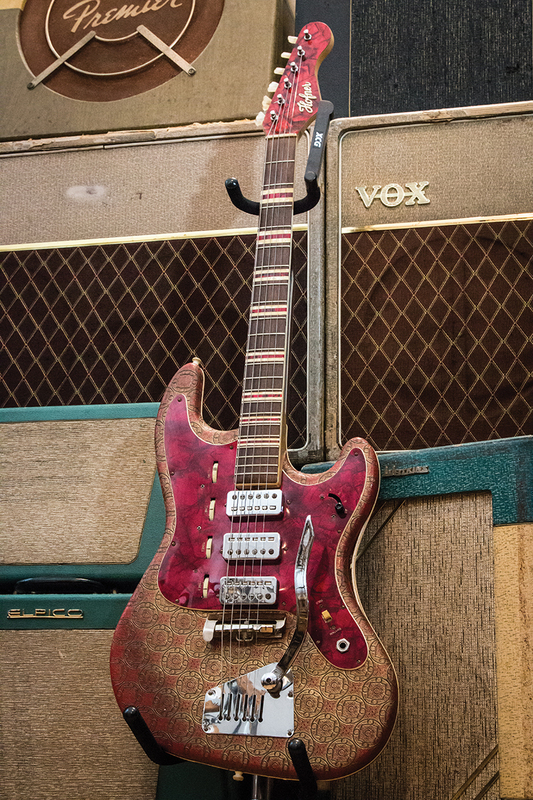 The most unique guitar in this collection of classics and curios is no doubt his striking ‘8-Guitar’. “I know this is a one-off, as I had it built purposely for Straight8UK. I drew up some designs and made a prototype, which I took to Chris Eccleshall in 1981 – one of the finest British guitar makers from that period and still going strong today. A rocker he may be, but like most 60s players, he grew up on healthy doses of pure British pop music, and Richard’s got the guitars to match. “I loved the mid 60s, all we did at school was talk about The Beatles,” he explains. 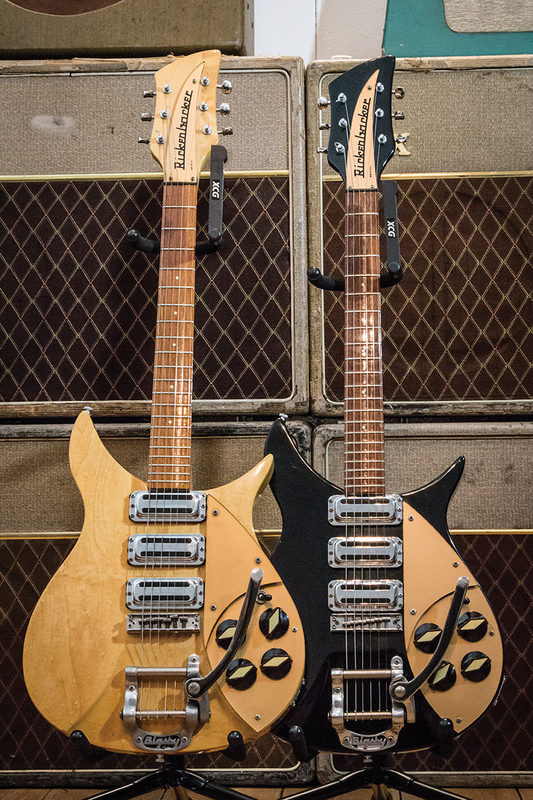 “John Lennon and a Rickenbacker just kick-started the whole rock ’n’ roll thing for me, he was the reason I picked up a guitar. The story goes that he had his natural Ricky 325 sprayed black, so I bought a natural and a black model, which sound the part through any of my Vox AC30s. “I’m not that much of an acoustic player really,” he admits. 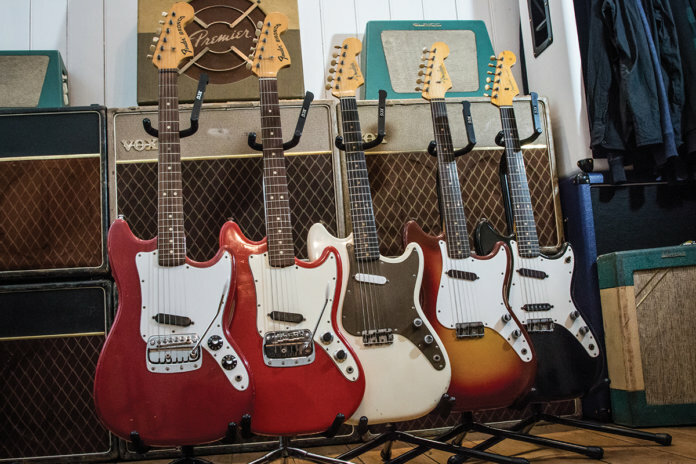 “But there are three here that I’m glad I have in the collection, including one of the long lost Maccaferri plastic guitars from the 50s that were found untouched in a warehouse in the 80s. I have all the tags and the original cardboard box for my G-40. They originally sold for about £50, but they’re collectable now so prices have risen dramatically. There are still some good deals out there like this Silvertone archtop L562 Colorama Kentucky Blue from the early 60s.